I've decided to join a new online baking group. Mac Tweets is an online group of macaron loving peers who set a challenge for each month. It's not a strict make this exact recipe kind of challenge but a theme and this month the challenge was movies. Wow I had lots of ideas, but I went with this one for a couple of reasons, namely that Barbie and the three muskateers must have been played in this house 50 times in the last month and also I really loved the idea of this edible stick. Not sure about elsewhere but here in Australia those Wilton cookie sticks cost me $11 for a bag of 20, and then I feel really bad about the wastage when I throw them away after one use. 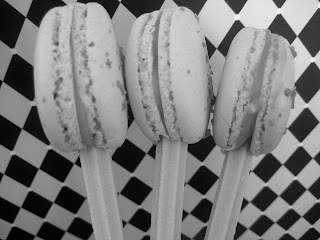 See my new macaron pop invention is not just yummy but it's also environmentally friendly and economical. Totally a win win situation. 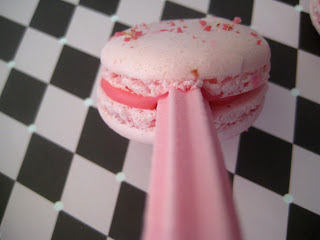 For this recipe I used my rose macaron recipe and at the stage where you join the 2 macarons together I just popped in a musk stick. Make sure you have enough filling and that it's a sturdy type of filling like ganache. and that's not the only idea I had for this new revolutionary cookie stick replacer, watch this blog and I'll have another special sweet something I came up with for you soon. Maybe if I put it in black and white it'll look a little more refined and I can pretend it's one of the older classic three musketeer movies. 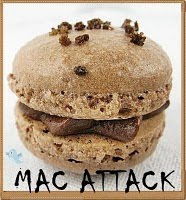 Blog round up for MacTweets this month is the 15th August so check out the site if you love macarons for lots of lovely pics and great ideas from the other members. Welcome to Mactweets and I love your pink 3 Muskateers macs! 50 times? Wow! I can see that after that you'd be seeing pink so the macs are perfect! And love the edible sticks. And the black & white version :-) Great macarons and thrilled that you have joined us - looking forward to seeing more themed macs from you! They look so cute, and sound so yummy :) I don't think I've ever had a rose-flavored cookie, much less a rose-flavored mac...I'll have to get on that! cute :) these are really great. my little girl loves this movie so she REALLY liked your macs as well. i love how retro they look! These are super cute! So much pink, love it. The price of wilton stuff here makes me sad too. 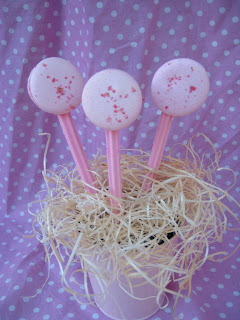 These are some of the cutest little macaron pops I've ever seen! And it's all edible? Fantastic! Love the pink! 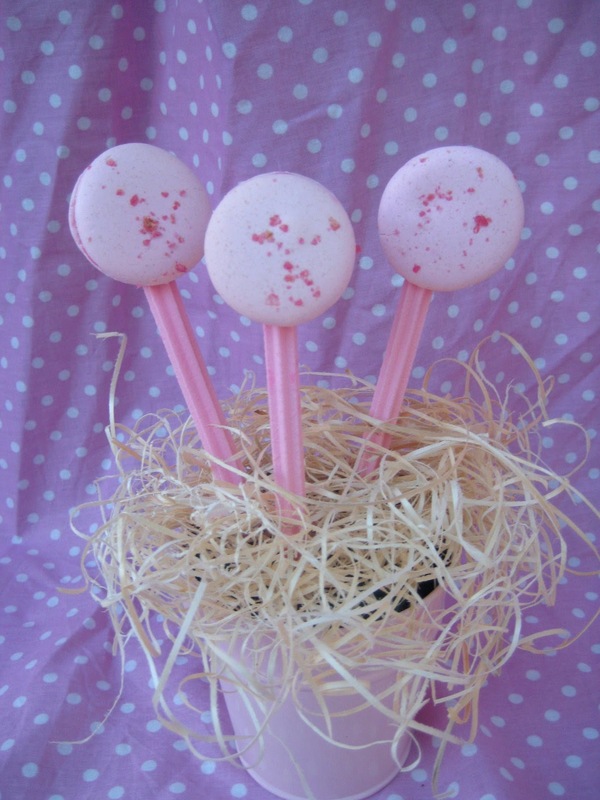 What a clever & cute idea to put macarons on a stick! So delicious! Hello! I have just find you'r blog and I have fall in love, I love you'r dessetr table's!! sooo cute!! and what about macarons... 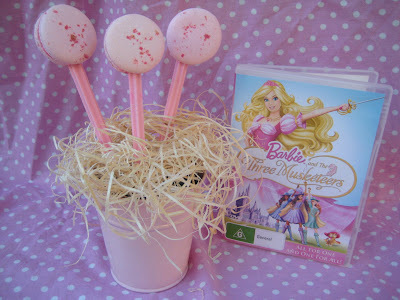 I have to try these "macapops"
Beautiful macs, pink and pretty. I love the theme too. well done! those macarons just look perfectly cooked! All for one and one for all! Love the pops. Darling, daraling idea! Your mac's are so PINK! Cute as can be. Yay for you Linda. Thank you for joining us at MacTweets with the prettiest pink macs I've seen in a while. Love the inspiration behind them, and am envious of the feet & colour! Gorgeous!! Linda, your pink macs are absolutely gorgeous. What recipe are you using? Did I miss that in the post? Your feet are beautiful. I had fun making these thanks all. Bonnie the recipe link is in the words Rose Macaron, but if you can't get it there on the side I have a Labels list and you should be able to find it there. Excellent idea! You are crafty! Welcome to the club, I just recently joined too!